One of Boston's best romantic restaurants, Top of the Hub features superb New England cuisine, panoramic views of the city, and jazz ensembles every night in its sophisticated lounge. 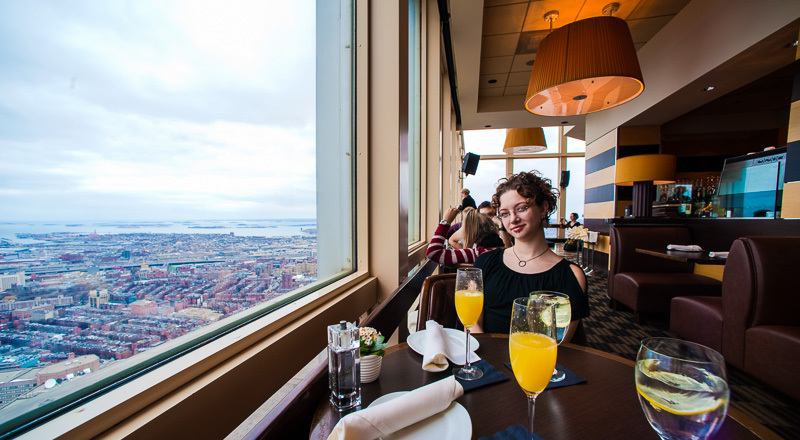 As soon as you enter the restaurant on the 52nd floor at the top of Back Bay's Prudential Tower, you'll be drawn to dramatic views of spectacular city vistas through floor-to-ceiling windows. The views alone would explain why Top of the Hub is a favorite Boston restaurant for special occasions - proposals, anniversaries, birthday celebrations. But superb service, delicious food and wine, and elegant ambiance bring diners back again and again. If you're visiting Boston for the first time, Top of the Hub's views make it the perfect choice if you're planning a splurge meal. Come for lunch or Sunday brunch for daytime views, and dinner or even just a drink in the lounge if you want to see city lights spread out before you. No time for a meal? Stop by Prudential Skywalk Observatory on the 50th floor for 360 degree views and free entrance when you have a Boston Discount Card. Top of the Hub emphasizes local Boston favorites and New England regional specialties, with a slight Asian twist evident in a few dishes - perhaps a nod to the city's international heritage. This is a wonderful place to try local seafood. Lobster is almost always on the menu along with other native New England seafood - look for Atlantic halibut and salmon, Wellfleet clams, East Coast oysters and scallops, and during their short season, small sweet rock shrimp from Maine. Clam chowder is always superb here. Top of the Hub offers several attractive fixed price menus including a couple of chef's tasting menus. You can't go wrong with any of them, so let your appetite and your wallet be your guide. This is one restaurant where you may prefer the prix-fixe menus to á la carte because of the appealing choices. In particular, the prix-fixe dinner menu with wine pairings almost always represents a bargain - you'll find interesting selections among the starters, main courses, and desserts, and the wine choices are always excellent. The popular Sunday brunch is only fixed price, but be warned - it's a rather huge meal. Stick with seafood options to avoid mid-day carb overload. However, the best way to feast on Top of the Hub's renowned cuisine while enjoy the best views is to come for the even more affordable prix-fixe lunch menu. 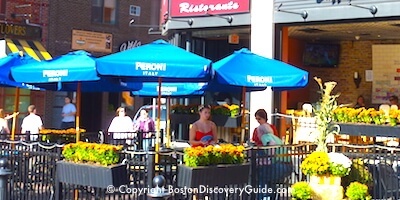 For just a couple of dollars above the twice-yearly Dine Out Boston bargain prices, you get a splendid 3-course lunch at this top Boston restaurant - and a special experience in one of the city's iconic attractions. Another way to enjoy Top of the Hub views and ambiance is to go for a drink in the adjacent lounge/bar. 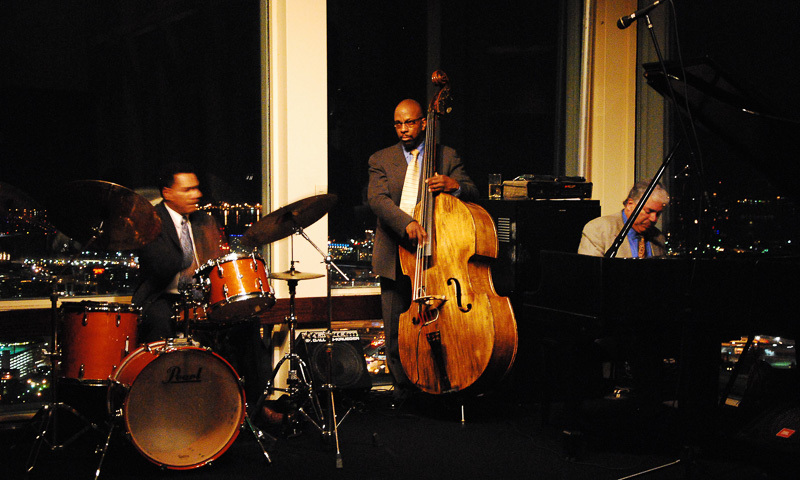 As a bonus, jazz ensembles play every evening in the lounge, silhouetted against spectacular night views of the city. You can also order food from the Top of the Hub Lounge menu, basically the same as the lunch menu and a great option for a late dinner. Another option - order just dessert for a mid-afternoon indulgence. If you're visiting Boston and planning to visit the Prudential Skywalk Observatory on the 50th floor, consider the Top of the Hub Lounge as an alternative. For not much more than you'd spend on Skywalk tickets, you can opt for the Lounge. 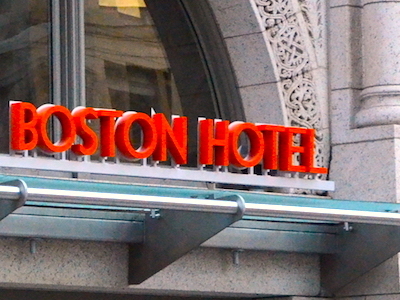 Enjoy a glass of wine or a cup of tea and perhaps one of the yummy desserts along with the best views in Boston. Cover charge in Lounge when jazz ensembles are playing: None. However, a per person minimum (less than the cost of a drink or two plus tip) does apply after 8pm if you sit at a Lounge table. No minimum applies if you sit directly at the bar. Look for lots of business attire - both formal and casual - at lunch and brunch. In the evenings, most diners dress up a bit, and some a lot. Guys, this means a jacket. Gals, black always works well - dress it up with a shawl, scarf, or jewelry if you want. Important to note: Top of the Hub no longer requires coats and ties for men. Business casual and casual chic are fine - but leave your jeans and t-shirts in your suitcase, and don't even think about shorts!